Non-invasive and minimally invasive aesthetic procedures have become the preferred treatment options for many people, particularly since the FDA approvals for Botox, facial fillers and laser skin rejuvenation for aesthetic purposes have been achieved. The demand for aesthetic skin procedures has grown nearly five-fold over the last one decade. Numerous benefits offered by aesthetic non-surgical procedures have made them increasingly popular in recent years. Key advantages of these procedures include that they are relatively painless or involve minimal discomfort, have a very low rate of side effects, can be performed quickly and at an affordable cost, avoid the typical risks and complications associated with a surgery, and the recovery period is very little or non-existent. Millions of patients regularly report high satisfaction, and the physicians and plastic surgeons providing these aesthetic procedures are equally satisfied with the outcomes. This has led to an easy availability of the major aesthetic procedures, making them accessible to all. 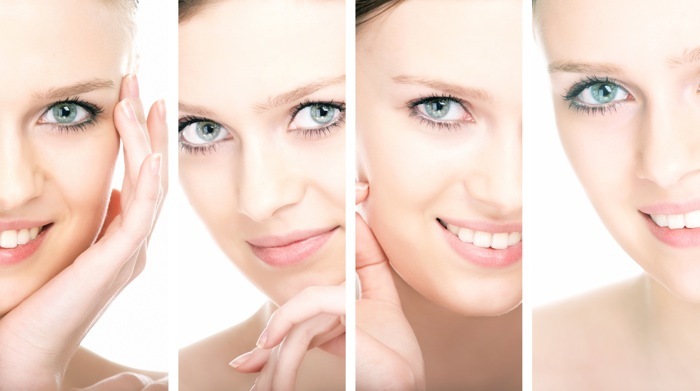 Facial skin is the most important part of the body from an aesthetic perspective that can reveal a person’s age. The upper one third of the face may have aging signs such as crow’s feet around the eyes, bags underneath the eyes, horizontal lines on the forehead, and frown lines between the brows. These lines begin as dynamic lines showing only during the movement of the face, but gradually become static and permanently visible. The midface can have nasolabial folds, while the lower third of the face can be marked by marionette lines, jowl formation, perioral wrinkles, and upper lip atrophy. Skin texture may become rough and dry, and conditions of mottled skin and hyperpigmentation may also compromise facial aesthetics. Minimally invasive aesthetic procedures can address these conditions in a variety of ways. It is possible to fill the wrinkles and lines, redefine facial contours, relax overactive muscles in the face, minimize unwanted hair, and reduce vascularities and hyperpigmentation. These are exfoliation techniques that can help achieve skin resurfacing at a superficial level without having to involve surgery or other aggressive aesthetic treatment approaches. Exfoliation is based on the principle of wound healing. When the superficial layer of the skin is removed using chemical peels and microdermabrasion procedures, it allows for skin cell renewal and regeneration of a healthier top layer of skin. These aesthetic procedures can lead to production of new elastin and collagen, improved skin hydration, and enhanced epidermal barrier function. Skin texture can become smoother and supple, along with reduction in pore size, fine lines, and superficial acne scars.